Feeling stressed? Overwhelmed? Need a break? I have the perfect solution for you. Find a nearby place to enjoy a British Afternoon Tea. That’s what my family did this weekend. 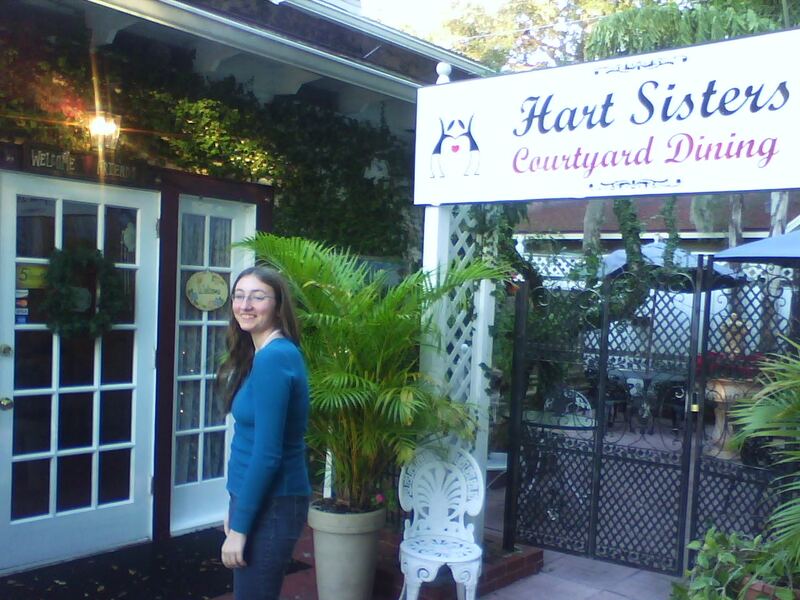 We discovered a gem–the Hart Sisters Tea Room in Sanford, FL. A traditional British Afternoon Tea is typically served between 3pm and 5pm and consists of your choice of tea served with scones and a side of Devonshire Cream plus jam, cucumber sandwiches (I know, it sounds ycchh. But if you’ve never had one, you won’t believe how good they taste) and assorted other pastries all presented on a silver, three-tiered serving platter. 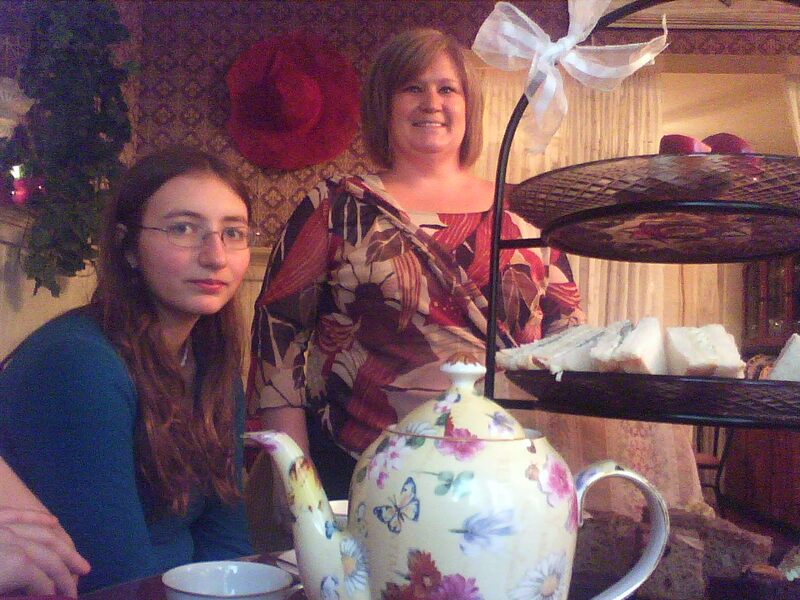 We met Susan nee Hart who co-owns the Hart Sisters Tea Room along with her sister, Anna. Although neither are British, they enjoy cooking and entrepreneurship. They opened their own catering business in 2004 and supplemented that in 2006 by opening the Tea Room. Their Tea Room is cozy and quaint–the perfect decor for an afternoon tea. The service was exceptional; the food, scrumptious. When visiting the Orlando area, it is worth the trip to Sanford to enjoy an afternoon tea with the Hart sisters. Here is a website that provides an excellent resource for locating authentic tea rooms throughout the world: www.TeaMap.com. This entry was posted on January 5, 2010 at 10:40 pm and is filed under Restaurants. You can follow any responses to this entry through the RSS 2.0 feed. You can leave a response, or trackback from your own site. Oh, I love going for tea. You’ve just reminded me that it’s been a few years and this would be a fun thing to plan sometime soon. Wish I could come to Florida to do it, though! We’re coming down in May for the Homeschool Convention in Orlando. Sounds like a lovely idea! Do you think i could get Doug to take me for afternoon tea? We have a few tea rooms around here. I think that would make for a lovely afternoon “date”. What do you think??? Can you help me convince him? Hmmm, as a woman who is married to Doug I would think you possess a myriad of means that could be utilized to help, uh, “persuade” Doug to take you out for tea… Here’s one located just a stone’s throw from where you live: http://www.SherylAnnsTeaRoom.com.